The sky is beautiful blue. This is a label to distinguish waste. This label indicates that the waste is irreproducible. 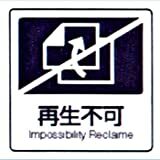 Does anyone explain English ("impossibility reclaime") label on this? Is this grammatically correct? And the word “reclaime” seems not English, but French or something.